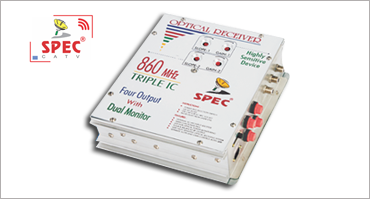 This optical receiver is advanced product designed for CATV. It has been parallel 4 outputs with double monitor. Available in aluminum alloy body as well as aluminum-cast water proof body. It is the best choice for CATV HFC network. We can control Gain and slope separately for both the line. It reduces the burden of the cable operator. By maintaining one amplifier, user can get according to the customer choice RF module can be vary. For operating these nodes different kind of SMPS are available in gain mode as well as power pass mode. These SMPS are high current MOSFET based.